compactPCI modules. The DC271 has four channels that can synchronously sample signals at 1 GS/s rates. The DC241 has two channels each with up to 2 GS/s sampling. Both modules use channel interleaving to achieve the same blistering 4 GS/s single channel performance of the DC211. 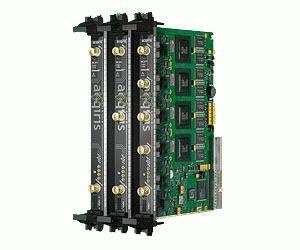 All the modules combine this ultrafast sampling rate with 1 GHz wide bandwidth and 512 kpoints of storage memory (optional to 32 Mpoints). Measuring just 233 mm by 160 mm in size the digitizers smash all previous speed, density and power consumption performance levels.